Canada's most affordable and flexible Video To DVD service. A personal service by a videographer with 10 years of video experience. Most tapes cost $30 for up to 2 hours; extra copies are just $10. Lowest professional transfer prices in Canada, but with the highest quality. Most customers nowadays prefer video files (rather than DVD) as they are of a higher quality and are easier to edit than DVD. Very competitive rate, video files for PC or Mac. Mini-DV and Digital8 transferred to lossless DV-AVI (for Windows) or DV-MOV (for Macs) files from $10/hour of video. Turnaround time of 2-4 days for 6 hours or less. 6.5 - 10 hours require up to 7 days. More than 10 hours will require additional time. Video tapes to DVD, Slides and film negatives to CD. Transfers to USB STICK or HARD DRIVE also available. Resume reels of actors, camera operators and producers provided for TV, movie industries and casting agencies. Transfers for VHS, S-VHS, Betamax, Video8, Hi8, Digital8, MiniDV, MicroMV and DVCPRO to USB stick or hard drive will be $10 per 60 minutes of video. Transfers for Betacam, Betacam SP, U-Matic and U-Matic SP to USB stick or hard drive will be $20 per 60 minutes of video. Prices do not include the price of a USB stick or hard drive. If you do not supply a USB stick or hard drive, then the cost of the USB stick or hard drive will be added to your final total. Transfers for VHS, S-VHS, Betamax, Video8, Hi8, Digital8, MiniDV, MicroMV and DVCPRO to DVD will be $15 per 60 minutes of video. Transfers for Betacam, Betacam SP, U-Matic and U-Matic SP to DVD will be $25 per 60 minutes of video. For customers from the US and other international destinations: when you are sending your videotapes, it is best to send them by the postal system (in the US, USPS, in England, Royal Mail, etc.) as couriers such as UPS and FEDEX add high import fees to anything coming into Canada. They may show a lower shipping price at the start, but then they'll try to "tax" your items. Whereas with the Postal Services, Canada Post does not add additional "tax" or "brokerage fees" onto your parcel. Please click on the embedded Youtube clip up top to see some examples. As you can see with the VHS-C example (first clip, Trevor Thurlow Productions work on the right side) you can see that most places are not able to handle S-/VHS-C tapes all that well. VHS-C is the small, camcorder variant of VHS (S-VHS also used the same sized cassettes for the S-VHS-C format), and was usually recorded in camcorders that used only a 2-head mono VCR to record the signal; 2-head VCR's laid down very little tracking on the tape (for both the regular and -C size cassettes) and as time passes S-/VHS-C tapes become very difficult to track and transfer properly. But one other thing that you can see is the color difference between the two sources. I'm able to provide you with a DVD that features video that you thought you'd never be able to see from VHS or any of your tapes. 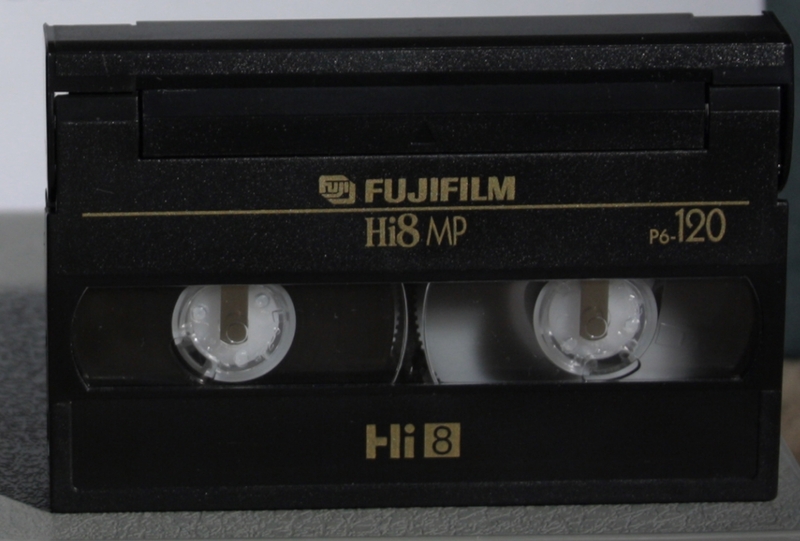 In the third clip you can see an example of a Video8 (8mm) tape that was played many times. Video has been used with permission. Over the years, just from the people stopping and starting the tape as they watched it, the tape itself became very crinkled. Unfortunately, this is physical damage to the tape, and there is no way to restore this unless you had a frame-by-frame restoration, which I do not offer at the present time. So for these types of tapes they would be transferred to DVD just as they are. Transfers At As Close To Broadcast Levels As Possible! Are You Looking For Professional And Quality Video Transfers In Pembroke, Petawawa, Renfrew, Ottawa or anywhere in Canada and the United States? Many people have been capturing their family memories and transferring their old family films to video tape since the late 1970's. But for many people the machines that could play back those tapes are wearing out and replacement machines are becoming hard-to-find, and people would like to put their videos on DVD so that they can just pop the disc into their computer or DVD player and watch their family memories. At Trevor Thurlow Productions we only transfer your tapes at the highest quality possible. Click here to find out the truth about those claims by other places about the "Number of Lines Of Resolution" that they list for each format. The majority of Video Transfer services online use the cheapest method available to transfer your videos. This method is done by running the various VCR's into a low-grade consumer-model DVD recorder or composite-to-USB converter that was purchased at a local department or electronics store; most of these recorders provide you with video that is very "washed out" on HDTV's, even at a 480p level. 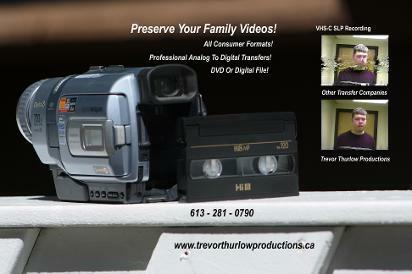 At Trevor Thurlow Productions I use broadcast-grade hardware and professional software to transfer your tapes. With this setup you can be guaranteed that when you pay for your DVD's you are going to get transfers that are not "washed out", and hold up very well on HDTV's, even when you play them in a DVD/Blu-Ray player that upconverts the signal to 1080p. At Trevor Thurlow Productions I also pay close attention to detail by monitoring the audio and video closely, but without "watching" it. You get the best level of quality possible with your private moments staying private. Plus, before your video hits the DVD I ensure that all the colors of your video fall within NTSC or PAL specifications, ensuring that your video is not damaging your TV while playing your video. Trevor Thurlow Productions takes your privacy very seriously. None of your information is passed on to other companies. Canadian residents please note that the appropriate tax shall be added to your total.